Math can be tough, Believe me, I KNOW. But the good thing is that with math, we can show very easily WHERE we stop our understanding. In class we always talk about how when we read a problem, we can usually take ourselves SO FAR before we become stuck. We NEVER Draw a picture first, we NEVER just dive right in - we start from the beginning. I may not know what to do right now, but there is stuff I can do to start off. 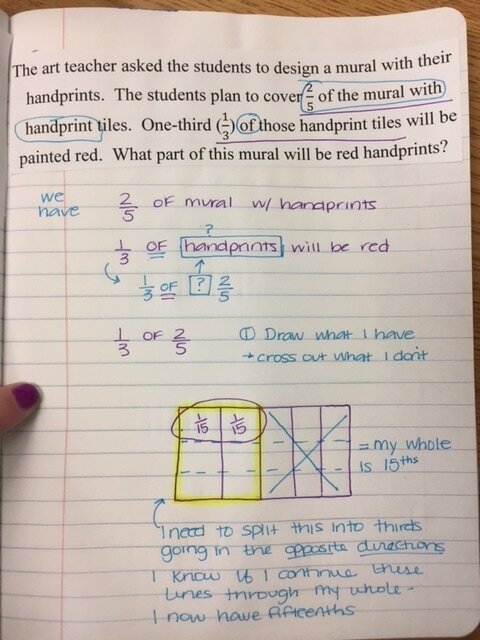 I can pull out the information, I can draw a picture to match it, I can write out my thinking. 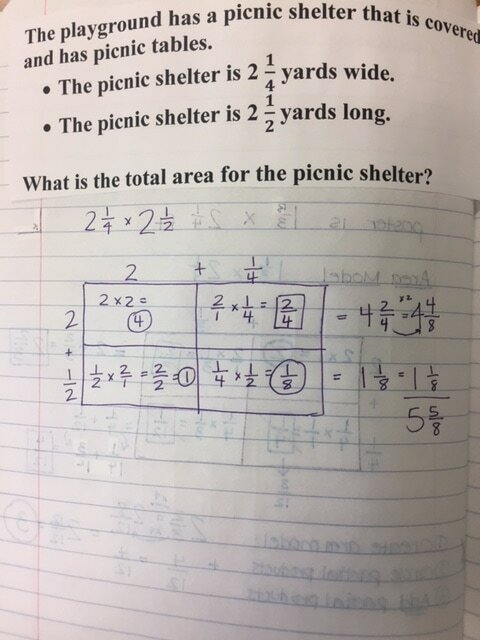 I can change the names of the people in the problem to my own name and names of people I know. When I am dealing with REAL LIFE situations that pertain to me, sometimes that makes the problem easier to understand. I can talk and ask myself questions and write out my thinking on my paper. If none of these work, I can follow EVERY Step Ms. Logue talks about in class- NO SKIPPING STEPS.. and hopefully it will trigger my memory. 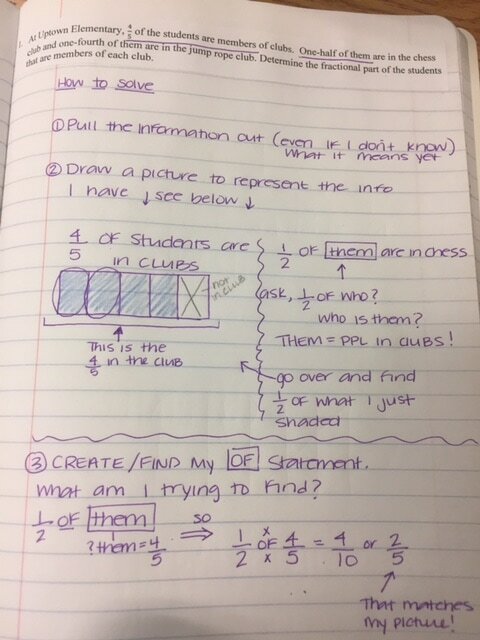 Look below at steps to solve a problem we did in class. Click each link below to be brought to a youtube video showing the strategy listed. It is NO secret that I am a fan of GRIDS and the AREA MODEL. The Area Model is my jam! In my personal opinion, they are the easiest to understand and very hard to mess up once you get the hang of it. 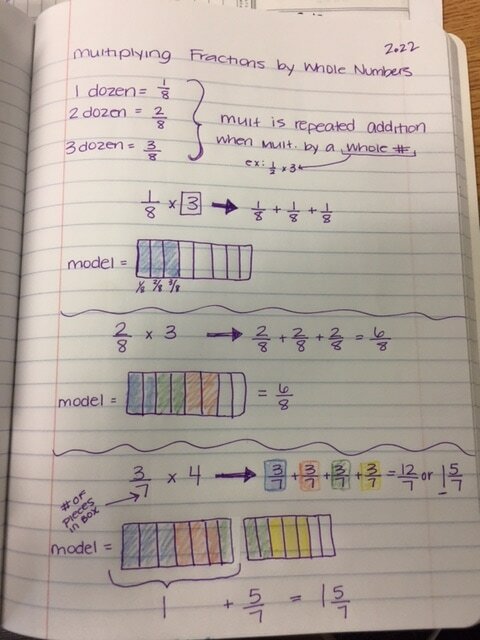 The area model will continue to be used when we do fractions as well and is ALWAYS the most popular strategy. 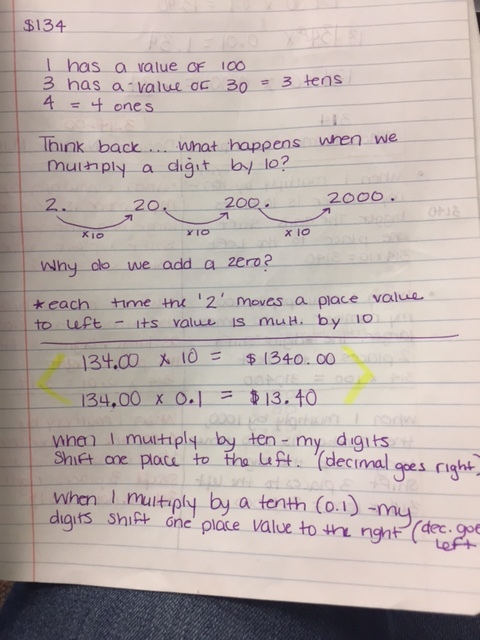 Below you will see a few different ways to multiply decimals. 1. 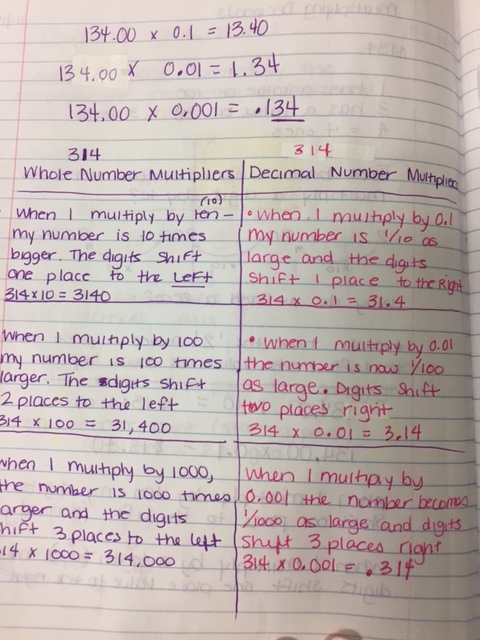 Since multiplication is just repeated addition, students may use a grid to repeatedly add the same number over and over. Ex: .35 x 3 --- the student would shade .35 two times to show the final product of .70. However, when we multiply by 0.1, 0.01, .001 - the opposite happens, it is the inverse. When we multiply these numbers we are essentially dividing by 10, 100, and 1000. 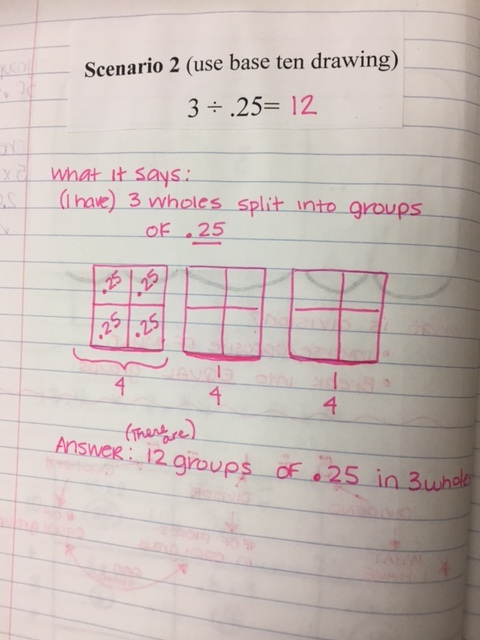 This is meant to show that when we multiply a number by 1, we get the original number, but when we multiply a number by LESS than 1, we will always get a smaller number. This next image shows the rules of multiplying numbers by 10, 100, 1000 and the inverse decimals and how they compare. 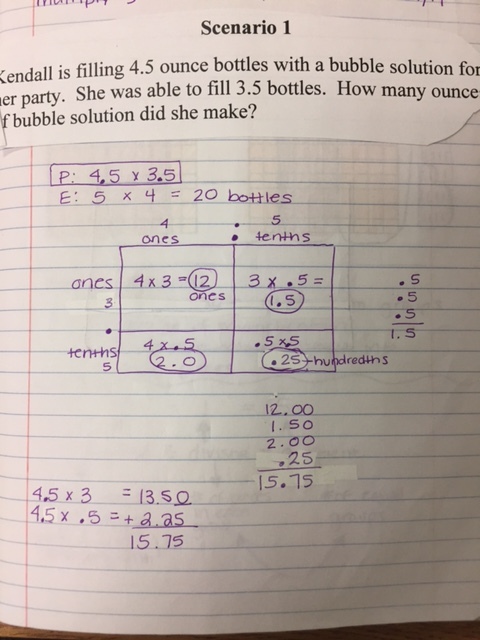 E- We estimate to determine what our answer should be around. 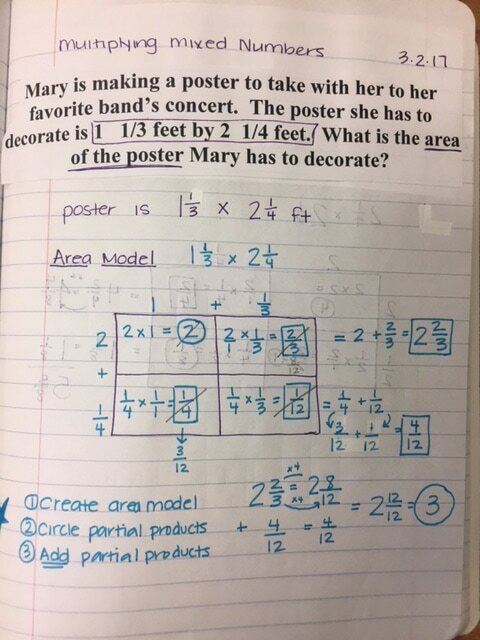 A- Solve the actual, real answer using a model. E- evaluate - compare this with your estimate and ask yourself - Does this make sense? If she filled 4.5 ounce bottles, does it make sense that she would use around 15 ounces? Often times when students have a crazy answer, this is where they can catch it. Using these steps helps to avoid what we often refer to as, "Careless mistakes" - when we do ALL of the steps (yes they may seem tedious) - we rarely make mistakes. Skipping steps is when we mess up! ​Below is the area model... Area models just break apart the numbers into smaller sections. See the model below. 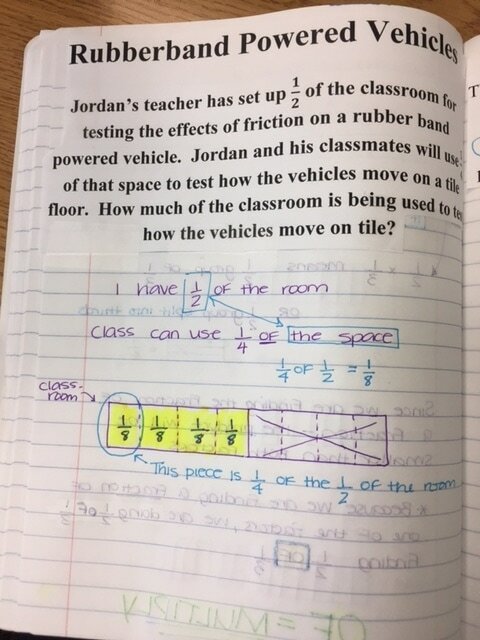 Once they have found each section, they add the partial products together to get the final answer. 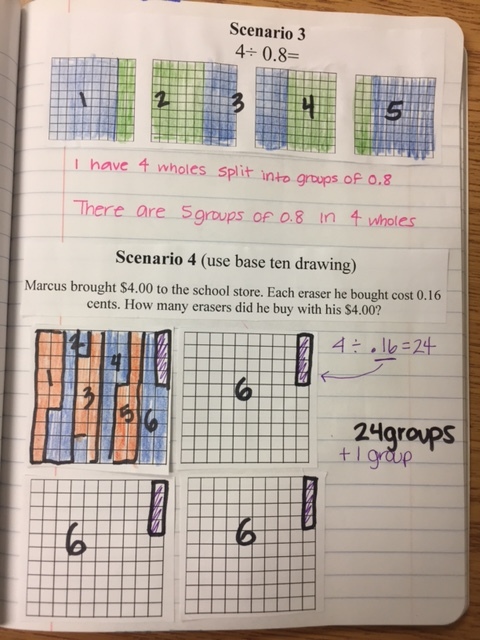 To Review with students on how to model a decimal number on the grid, we began by shading in .67 of our whole number. Because .67 almost fills up the entire grid, you only need .33 to fill the entire grid -- since .33 is less than .67 that means that .67 would round to 1 whole. We repeated this process for the last two problems on the grid sheet. We expanded rounding into number lines. Number lines are the HARDEST to create, but the easiest to see with your eyes! 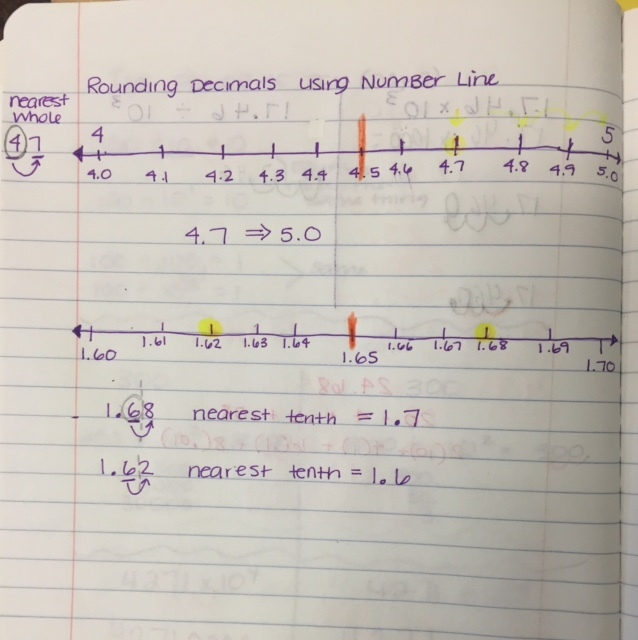 To help the kids know how to build their number line, we look at what the question is asking. 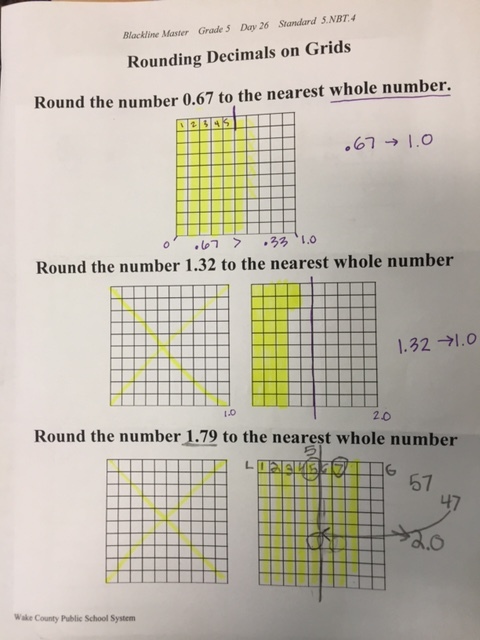 If the question says, round 4.7 to the nearest whole number - we know that our number line will START and END with whole numbers and have the next place value in the middle, in this case - tenths. Students should ALWAYS find the halfway mark and put a line through it. 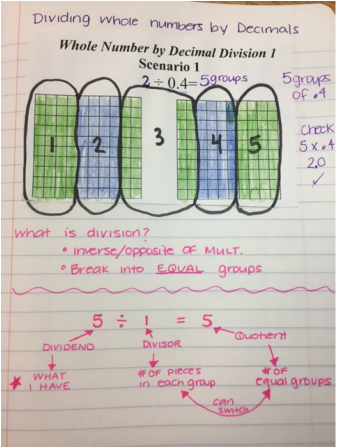 This creates a better visual for the rounding process. Circle the tenths place and put a line beside it. This tells me that my answer CANNOT go beyond this line. They are asking for tenths, so my answer must stop here. Think to myself - what is half way between 1.6 and 1.7. Once you discover the halfway point is 1.65 - mark it with a line. 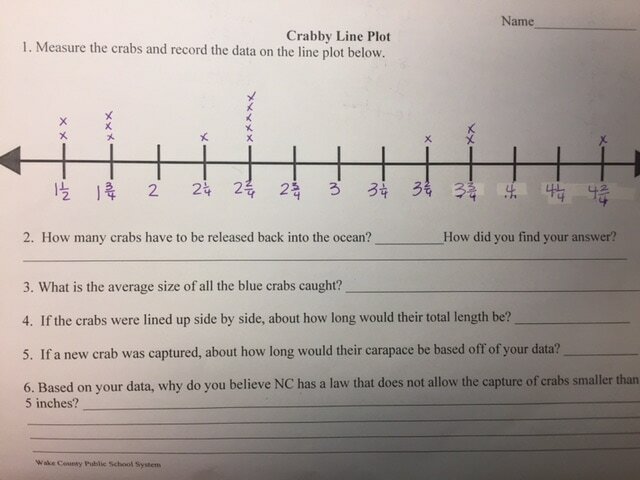 Fill in the rest of your number line.